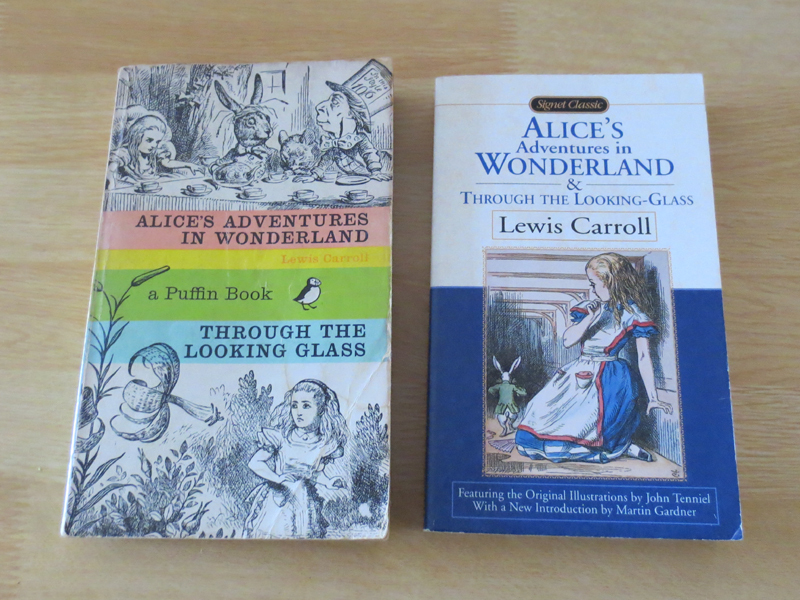 Yesterday I wrote that I want to enjoy "Alice's Adventures in Wonderland" with an innocent child's heart free from common sense or any restrictions. But the author was a mathematician as well. I think he must have been a man of logical thinking. As an adult reader, I can't help thinking there must be some logic there. 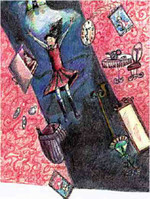 That's why there are a lot of books on Alice's "riddles" out there. The story is full of wordplay and in many cases it is next to impossible to translate into Japanese. There lies the greatest pleasure to read it in original English. One example is the scene where Alice asks the Mouth why he hates cats and dogs. The below is a brief extract from the book. 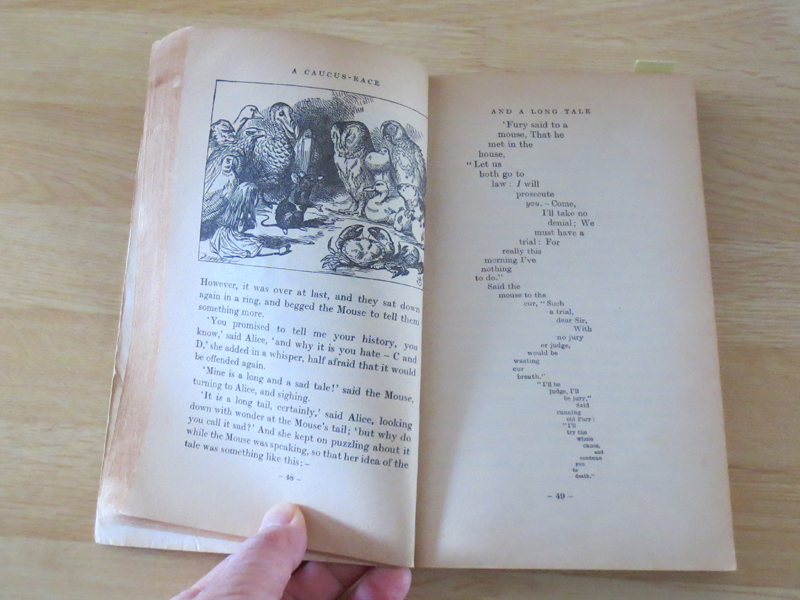 The picture shown above is the copy from the book. The Mouse's story doesn't make any sense, but you don't have to rack your brain trying to make out what it means. For Alice is also scolded by the Mouse like this; "You are not attending!" This story is in the public domain, so you can download the story all free. I myself have an e-book version of it and in addition to it, I listen to the audio book, which is also free. This one is my favorite, It comes with nice sound effects and music. 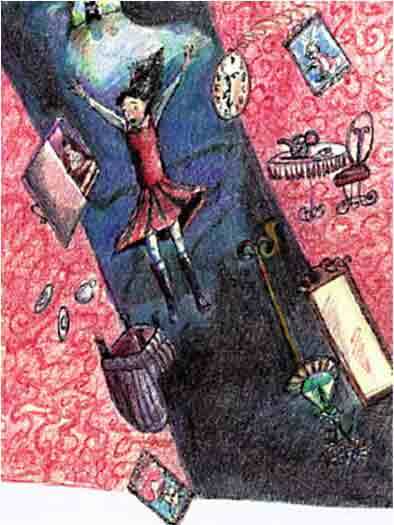 I found a picture from "Alice's Adventures in Wonderland" yesterday on the facebook page of my friend, feeling so nostalgic. I searched my house for my old copies and found them. I think the one I read as a child was an easy version for kids, and that, the translated version, but I never forget the excitement when I first read it. What a wonderful and nonsense world! Some decades later, as an adult, I bought the original English version, only to be disappointed to find it so difficult for me back then. I thought it was because my English reading comprehension was not good enough. But later I came to think it might not be. 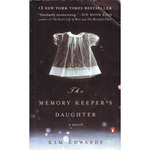 For there are actually a lot of English novels for adults that I can read with ease. News articles are much easier. But now I think I may have been wrong. The truth is as a child, I was free from any restrictions and didn't judge any thing by any common sense. The logical thinking just prevented me from enjoying it without thinking. Now that I realize that, I make my mind free and just have fun. I bought all the books shown above as an adult. The oldest one was probably almost 25 years old or older, I'm not sure. 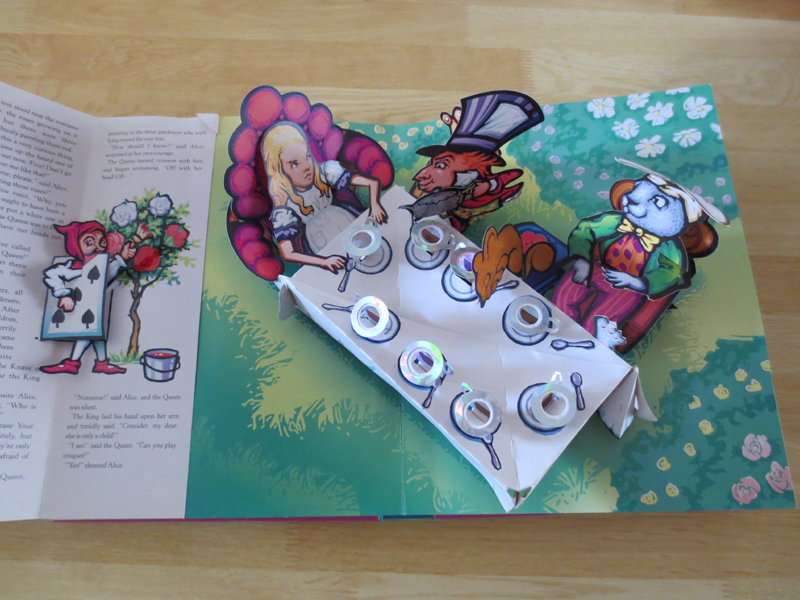 The pop-up book is 9 years old. 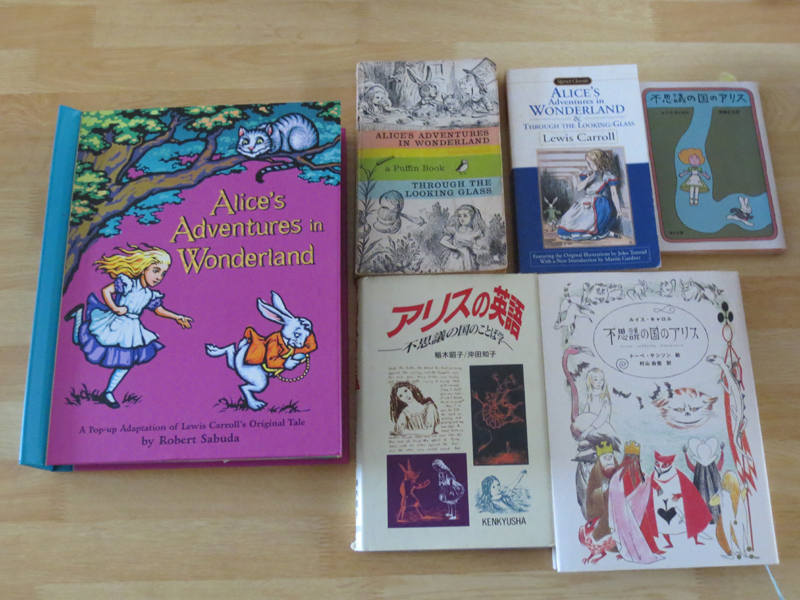 I like Tenniel's illustrations, but the illustrations drawn by the author himself are also appealing. "But you and I and Phebe, we have a choice. To be bitter and angry, or to try to move on. It's the hardest thing for me, letting go of all that righteous anger. I'm still struggling. But that's what I want to do." The old proverb was right: God never closes a door without opening a window. 再びペーパーバック"FROM THE MIXED-UP FILES OF MRS. BASIL E. FRANKWEILER"の中から. Some people spend all their time on a vacation taking pictures so that when they get home they can show their friends evidence that they had a good time. They don't pause to let the vacation enter inside of them and take that home. 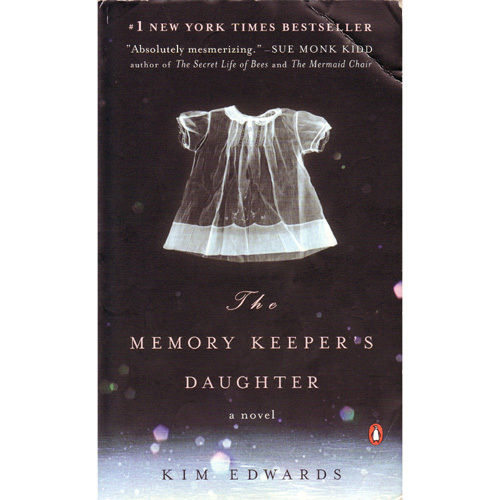 最後に読んだペーパーバック"FROM THE MIXED-UP FILES OF MRS. 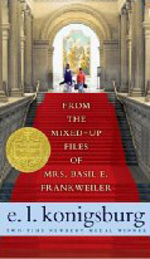 BASIL E. FRANKWEILER"の中から. "Why pick on me? Why not pick on Steve?" he asked. Claudia sighed, "I don't want Steve. Steve is one of the things in my life that I'm running away from. I want you." Despite himself, Jamie felt flattered. (Flattery is as important a machine as the lever, isn't it, Saxonberg? give it a proper place to rest, and it can move the world.) It moved Jamie. He stopped thinking, "Why pick on me?" and started thinking, "I am chosen."